As the demand to buy Bitcoin grows, so do the number of places and ways to acquire the cryptocurrency. Most people start off with a Bitcoin broker like Coinbase, which allows you to quickly buy Bitcoin but comes with the added inconvenience of full identity verification and geo restrictions. Then there are Bitcoin trading platforms like Kraken, which also allow you to buy and sell Bitcoins, but there again, you go through the hoops of identity verification, limited payment methods, geo restrictions and so on. And what if all you ever wanted in the first place was a way to simply buy and sell some Bitcoins in the way Bitcoin was originally intended to be exchanged – from person to person, without needing the permission of a central authority? Well, then you’ll want to check out Paxful. Paxful joined the cryptocurrency scene in 2015 and since then, has become one of the most popular peer-to-peer Bitcoin exchanges around. And that’s a huge part of what makes this exchange unique: unlike most Bitcoin brokers and trading platforms, Paxful’s team of experienced developers are all about building a global peer-to-peer payment platform where buyers and sellers of Bitcoin from around the world can exchange the cryptocurrency freely. If that sounds too confusing, an easier way to think about Paxful is as a sort of cryptocurrency eBay. Instead of being a merchant that buys and sells Bitcoin, Paxful acts as a mediator between individual buyers and sellers, simply providing a public space for users to make their deals. Open to everyone (almost). Unlike most cryptocurrency exchanges, Paxful doesn’t have geo restrictions and is open to pretty much anyone in the world. The only exceptions are New York state residents since Paxful doesn’t have the required BitLicense. Can buy without ID verification. Unlike the majority of cryptocurrency exchanges out there, Paxful gives users the option to buy bitcoin without having to go through the rigamarole of AML/KYC regulations. That means no ID necessary for many of the payment options. Can buy Bitcoin anonymously. 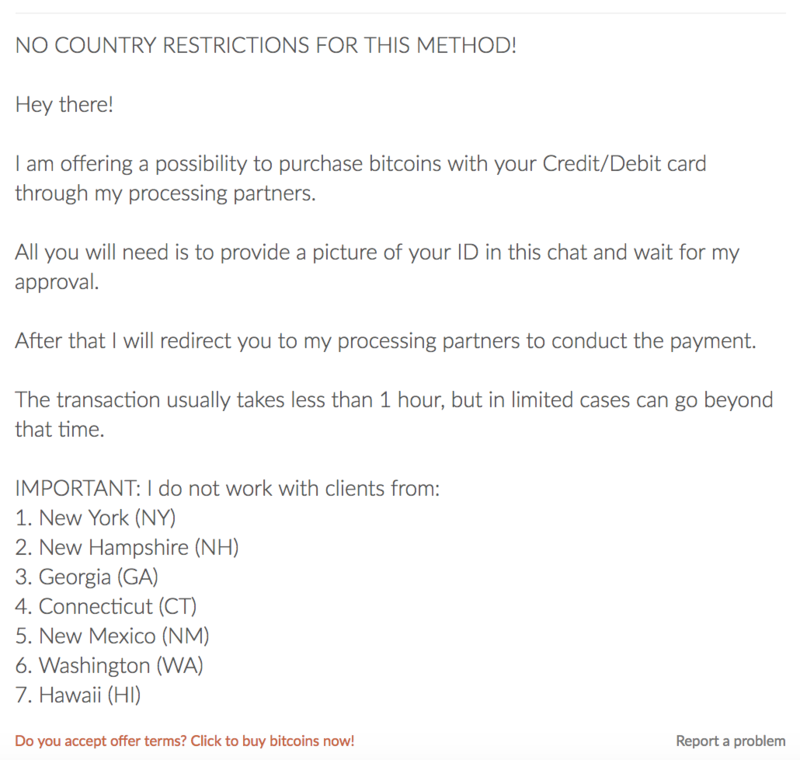 The lack of ID verification also means that you can buy Bitcoin anonymously using several of the payment methods. For example, buying gift cards with cash and then exchanging them for Bitcoin on Paxful. No buy/sell limits. Paxful doesn’t impose any limitations on how much you can sell or buy. That’s up to the participants of each trade. Zero transaction fees for the buyer. One much-touted feature of Paxful is that it doesn’t charge the buyer any fees. Which is great but not entirely the truth since the site does charge sellers a 1% fee on the total sale amount and most sellers price this fee into their exchange rate. Huge range of currencies. Since Paxful is a global peer-to-peer platform, you have the option to buy and sell in the currency of your choice – from AUD to ZAR. You can even buy Bitcoin using gold and silver. Over 300 payment options. One of the best things about Paxful is that they offer the most diverse selection of payment options. 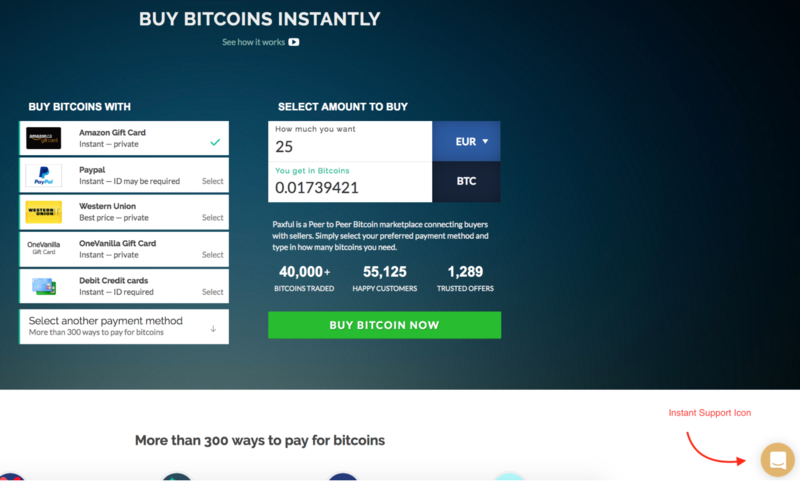 At the moment, the platform lets you choose from 300+ ways to pay for bitcoins, including gift cards (i.e. Amazon, iTunes, AT&T), online transfers (PayPal, Neteller, Skrill) as well as more traditional methods like debit/credit cards and Western Union. The huge range of payment options is actually one of Paxful’s best innovations since it doesn’t offer any set payment options itself but rather makes it easy for sellers to add nearly any custom payment method on the fly, which is what makes it possible for the platform to adapt to local markets around the world. Keep in mind that whereas there are a lot of payment methods available – some have much better rates than others. We go into more detail about this below but in general, you’ll usually get the best price for buying Bitcoins using a hard to reverse payment method such as cash deposits or wire transfers as opposed to more easily reversible payment options like Paypal and Venmo. True to their original vision of a global peer-to-peer exchange, Paxful doesn’t place limitations on supported countries. So, technically – everyone is welcome to use this platform, no matter where they’re located. So ultimately, even though you can technically sign up from anywhere in the world, the range of offers that are available to you can vary depending on where your residence is. If Bitcoin has dipped and you want to buy it pronto, the last thing you want to do is wait around for days – sometimes weeks – in order for a cryptocurrency exchange to verify your ID so you can start buying! Thankfully, this doesn’t happen with Paxful. Once you’ve confirmed your email, you can get started buying Bitcoin. Paxful doesn’t require you to submit all the ID and address verification that other Bitcoin exchanges require. On the other hand, sellers accepting gift cards typically won’t ask you to prove your identity although they can charge higher fees for the risk assumed. 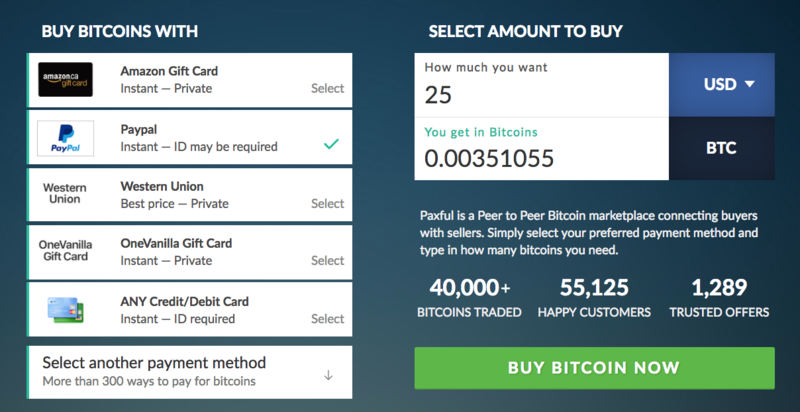 Using this method makes it possible to buy Bitcoin anonymously since you can go to a local store and buy a prepaid gift card in cash and then trade it for Bitcoin on Paxful. Overall, the ID verification process with Paxful can take as long or as short as you want, depending on the payment method(s) you choose. What’s great about this, of course, is that you don’t necessarily need to go through the rigamarole of providing your ID, your address, and a snapshot of you holding various verification documents in order to simply buy some Bitcoin. You simply take 2 minutes to sign up and then you can get started buying Bitcoin right away. 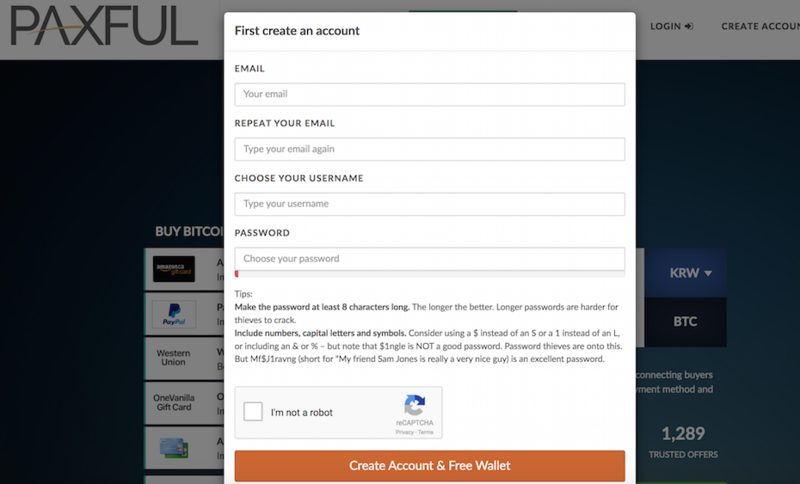 Paxful offers a simple, easy-to-use user interface which makes the process of buying Bitcoin on Paxful very straight-forward. That being said, it does require some work on your part since the range of flexible options means you’ll have to spend some time looking for the right offer for you. Here’s what the process looks like, from registration to buying Bitcoins! Once you’ve registered with your email, username and password – you’ll receive an email with a confirmation button. click on that and you’ll be redirected to Paxful. At this point, you’ll be prompted to setup 2FA (two-factor authentication) with your mobile device as well as two security questions. This isn’t a requirement to continue using Paxful but it is highly recommended, especially if you’re storing funds in your Paxful account. It takes just 2 minutes to do so don’t skip this step. Now the fun begins! 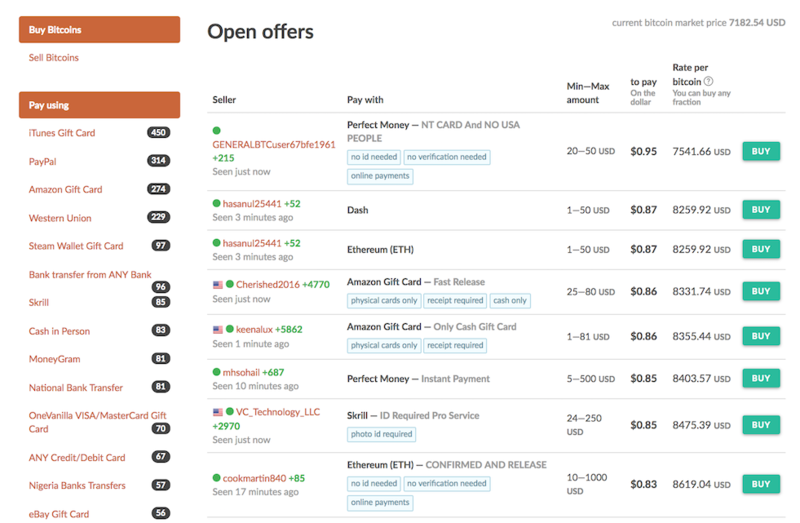 As you can see, the list of open offers shows at a glance all the sellers and their feedback, what you can pay with, how much you’ll be paying on the dollar as well as the rate per Bitcoin. Now it’s up to you to search through these open offers to find the one that best suits you and your needs. Note: As you can see, this particular seller doesn’t require ID and his markup is very low. On the other hand, if you choose a gift card as a payment method, the markup will typically be higher. Once you click the BUY NOW button, you’ll be able to chat directly to the vendor to complete the exchange and get your Bitcoins! As easy-to-use as Paxful’s interface is, it can be mighty confusing to navigate through all the offers, especially when you’re first using the platform. So to help get you familiarized with the ins and outs of buying on Paxful, here’s a list of tips! Keep in mind that Paxful is a person-to-person exchange and people aren’t always available. So make sure that the vendor is online and wait until the vendor responds before you upload any documents or make any payments. This prevents unfortunate cases like you uploading your gift card details and then having the time limit expire. Once the trade is cancelled by the system, the Bitcoin held in escrow will be deposited back to the vendor’s account and the vendor will have access to your card details. That’s not safe so make sure the vendor is online and responsive before you proceed with the payment. No brokering gift cards. This means you must be the original owner of the gift cards – many vendors will go as far as asking for receipt of purchase. This is because if you bought the gift card from someone else, they might rip the card, leaving you with no way to prove that it wasn’t you who did so. Using a brokered gift card on Paxful will get you banned so buy yours directly from a shop. The whole amount only. If you buy a $100 gift card, you can’t buy just $50 worth of Bitcoin with it – you must trade it for the whole amount. When a vendor redeems a gift card, he can only take the whole amount and you may not be able to get back the difference so always plan to use the full amount of a gift card. As a first-time buyer on Paxful, you’re naturally cautious about getting scammed by an unscrupulous vendor. But also keep in mind that the vendors are taking a significant risk as well. For example, the vendors selling Bitcoin understand that Bitcoins are irreversible whereas many payment methods are not – which means that a vendor who exchanged Bitcoin for a photoshopped gift card won’t be able to get their Bitcoin back. Because of this, many vendors may ask you to follow specific, seemingly nit-picky instructions, such as insisting on very high quality photos and even writing your username in pencil on a gift card receipt. As long as their demands are within the rules – follow them to a T. It makes the process easier and safer for the both of you. Paxful offers a huge variety of payment methods and the the price you end up paying can vary a lot depending on which method you choose. It usually comes down to the risk that the vendor takes to accept the form of payment. For example, payment methods like Paypal, Venmo, Chase QuickPay, Google Wallet, and VISA/MasterCard/Amex gift cards are instantly reversible – which means that the vendor is assuming the risk of transferring irreversible Bitcoin for a payment method that can easily be reversed. That’s why the amount you’ll pay for Bitcoin will tend to vary depending on how reversible the payment method is. The easier to reverse means you’ll be getting less Bitcoin for your money. On the other hand, less reversible payment methods like bank transfers and cash deposits have less risk so in turn, less of a markup and offer a better price. Sometimes avoiding costly mistakes can be as simple as following the directions. And this is one that you should absolutely make sure you follow: clicking the “I have paid” button after you’ve completed your side of the deal. Again: once you’ve followed all the vendor’s instructions and provided all the necessary documents, you need to click the “I have paid” button. Otherwise, the time limit expires and the Bitcoin gets released from escrow back to the vendor – and you don’t want that since you’ve already made payment. So make sure to click this very important button! This is one of the most important questions you can ask before you get started with a Bitcoin exchange. And when it comes to Paxful, it’s a two-pronged question. First, you want to know if Paxful itself is a safe and secure website since you’ll be receiving and possibly storing Bitcoin on their wallet. And of course, you also want to know if Paxful is a safe website on which to buy Bitcoin in the first place. As in, can the sellers on the site be trusted and what recourse do you have if you happen to get tricked by a scammer. We’ll address both of these one-by-one. Everyone who registers on Paxful gets a free Bitcoin wallet. And it is a secure wallet but it’s not the most secure option you have as far as Bitcoin wallets go. Here’s what we mean: Since 2016, Paxful started securing their wallet with BitGo integration, which definitely has some perks like being easy-to-use and free. It’s also a multi-signature wallet known for its high level of security against malware, hackers, and server attacks. But despite its good reputation, Paxful’s wallet is still a hot wallet, meaning that it’s held online and connected in some way to the Internet. That’s what makes these types of wallets so convenient – since you can spend Bitcoin from it at any time. But at the same time, the fact that a hot wallet is virtually always connected to the Internet makes it more vulnerable to attack than cold wallets. Cold wallets are offline wallets, meaning there is no connection between the bitcoin wallet and the Internet, which makes it impossible for hackers to steal funds from the wallet. So yes, the Paxful wallet is safe. But it’s not the safest. Which is why we advise only storing a small amount of Bitcoin on it at any given time – an amount that you plan on using in the near future to spend or trade – and moving the majority of your Bitcoin to a cold wallet for better security. Password strength. Your Paxful wallet is as secure as your password so use a super strong one that’s a combination of upper and lower case letters, numbers and symbols. Enable 2FA. With every exchange and Bitcoin wallet, you should always enable 2-factor authentication (2FA). It’s a simple step that goes a long way toward protecting your account. Paxful’s wallet supports Google Authenticator, Authy and SMS-based 2FA and whereas any of them are better than none – the Google and Authy options are the most secure. Be sure to enable 2FA when logging in as well as when sending out and releasing Bitcoins. Stay alert. Unfortunately, the crypto world is rife with phishing scams and there will always be scammers trying to trick you into giving away your password. So always make sure you type in the right website – https://paxful.com – before entering in any account details. And of course, keep in mind that Paxful will never ask for your personal account details like your username or password in any way, whether through email or chat. Be careful with your information and don’t share it with anyone. 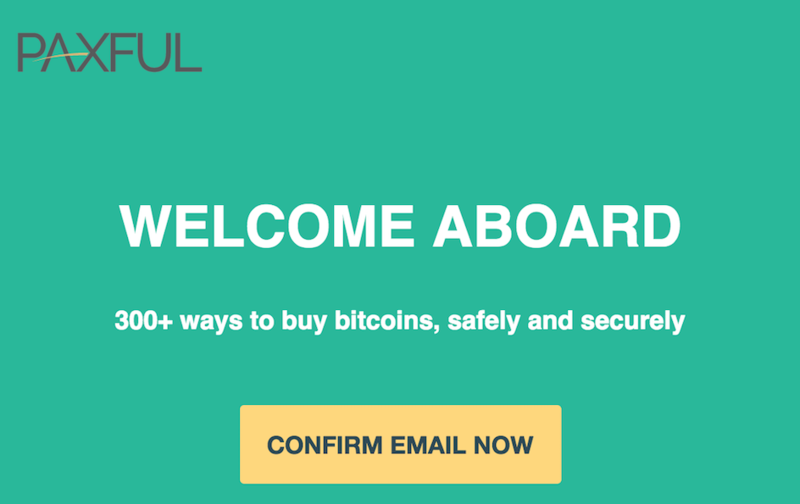 Is Paxful a safe way to buy Bitcoin? 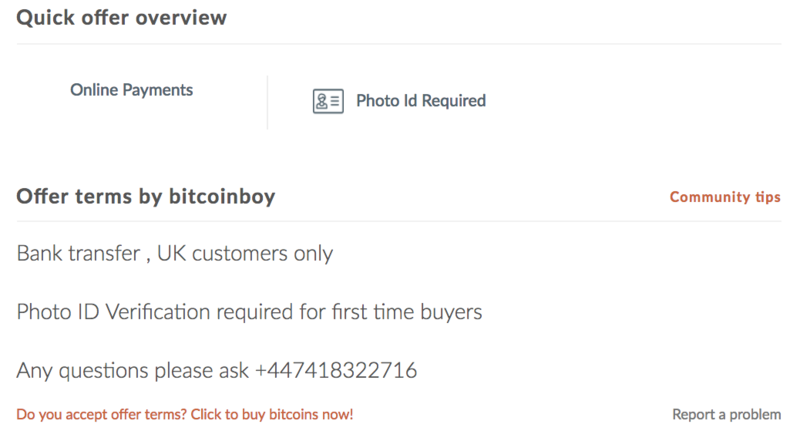 As you know by now, Paxful is not a Bitcoin broker and the company does not sell Bitcoin directly to consumers. Instead, it merely offers a platform so that Bitcoin sellers and buyers can exchange directly with one another. This sort of flexibility comes with both benefits and drawbacks. The benefits, of course, are that you can buy Bitcoin without having to jump through identity verification hoops or waiting for days or weeks to have your funds cleared so you can buy some coin. The drawback is that you need to exercise caution when choosing which vendors you’ll be buying from. And this is the most crucial part in making sure that you get all the benefits of buying Bitcoin on Paxful without the downside. If you check out online reviews, you can see that many of Paxful’s negative reviews are made by buyers who make the mistake of confusing a seller’s integrity with the platform’s integrity. But just because one seller proved to be an untrustworthy scammer, it does not mean that Paxful itself isn’t a legit platform. It’s the same thing with any other peer-to-peer platform. For example, if you were tricked into buying a fake Cartier watch on eBay that the seller claimed was authentic, it doesn’t mean that the eBay platform itself is a scam – simply that there was a bad actor on the platform. When it comes to peer-to-peer exchanges of any kind, there is always the potential for fraud on both sides and the thing that really matters is what the platform does to protect their users from scammers. Escrow. Paxful has a built-in escrow that keeps funds in the control of an independent third party deposit account until all the terms have been met. Support Forum. Another perk is that Paxful has a very active support forum where both buyers and sellers can ask any question and get answers. Good record of mediation. Paxful actively tries to weed out scammers and provides a dispute process that buyers or sellers can go through. It becomes available 3 hours after a trade has started and allows Paxful’s moderators to look at the evidence provided and award the coins to the legitimate party. As long as you have played by the rules and prove you’ve upheld your end of deal, you should be protected even if you had the misfortune of dealing with a scammer. 24/7 Support. One of the best things about Paxful is that it’s one of the few Bitcoin exchanges that offers 24/7 support and live chat. One every page throughout the site, you’ll see the Instant Support logo at the bottom of the screen that you can click on for live chat. So you’re new to Paxful and both excited to buy Bitcoins as well as a little apprehensive about the possibility of being scammed. Don’t worry – the majority of vendors on Paxful are looking for the same thing as you: to take part in fair, straight-forward exchanges. As for the few bad apples that come looking for easy marks? Here’s how to stay clear of them. In a peer-to-peer marketplace, reputation is crucial and every seller’s feedback rating will be clearly displayed. Stick to sellers who have lots of positive feedback (+200) and preferably no negative feedback. One common tactic of scammers is to try to get you to do a trade outside of Paxful. They may cite the fees that Paxful imposes on sellers (1%) and try to tempt you with better prices if you exchange with them outside of the platform. Don’t do it! No matter how tempting their Bitcoin prices may seem – keep in mind that if you exchange contact details and go outside of Paxful, there’s nothing to protect you. No escrow, no mediation process. 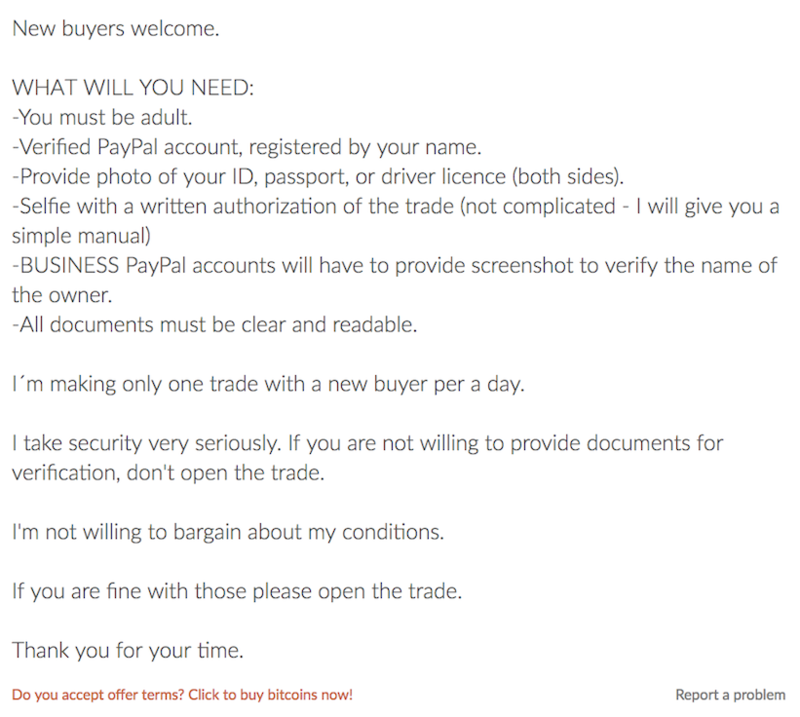 After you’ve made a payment, there are absolutely no guarantees that the seller will send you the promised Bitcoins. So do all trades on and through Paxful. Another common tactic that scammers will try to pull is to ask you to cancel a trade after you’ve made payment. For example, say you upload your gift card details knowing full-well that the card is new, unused and legit. The vendor then says that the card doesn’t work and asks you to cancel the trade. You check and find that the vendor has ripped the card of its balance. At this point, it’s imperative that you do not cancel. If you cancel the trade, as the vendor requests, the Bitcoins will be released from escrow back to the vendor, leaving you with an empty card and no Bitcoin. 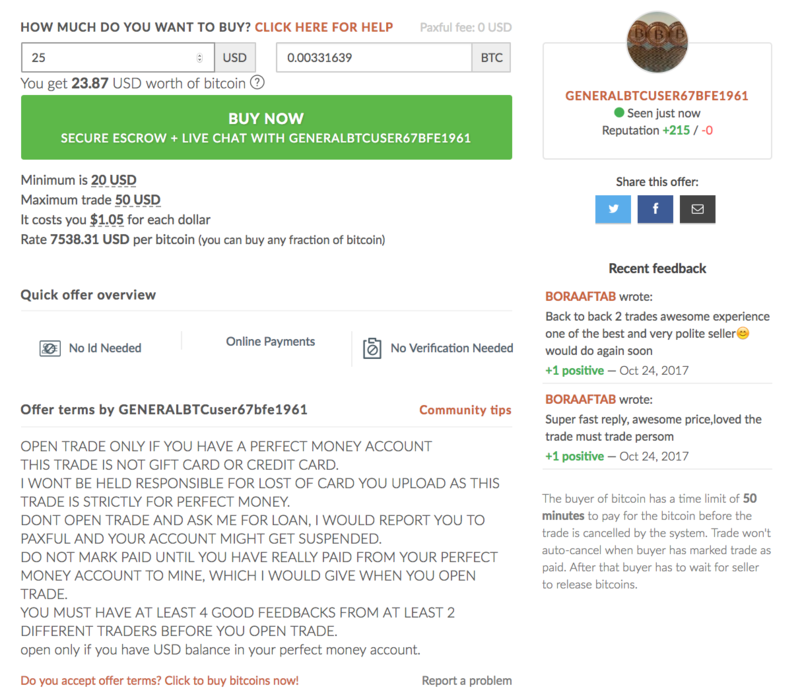 So if a vendor ever tries to pull this scam on you and asks you to cancel after you’ve paid – refuse to cancel, click the “I Have Paid” button and open a dispute so the moderators can get involved and aware you the coins. Is Paxful Worth Signing Up for? All in all, Paxful is a unique method of buying and selling Bitcoin which allows users to interact and exchange directly with one another. This flexibility allows for anyone anywhere in the world to sign up and start using the platform right away. It also allows for a huge range of payment options as well as instantaneous and even anonymous trades. So compared to other Bitcoin exchanges – which can take days or even weeks to get approved for – Paxful allows you to quickly and easily buy Bitcoin using pretty much any payment option you want. Of course, the flexibility comes with some costs. Mainly, a higher exchange fee – you’ll find that the exchange rate on Paxful is higher than on regulated trading platforms like Gemini, which is due to the fact that sellers are taking a much bigger risk by selling Bitcoin to strangers. Since Bitcoin transactions are irreversible whereas many payment methods are easily reversible, the vendors are taking a significant risk and charging a premium for it. But even taking that into account, Paxful is definitely a legitimate and worthwhile platform to go to when you want a quick, zero-identification-needed way to buy Bitcoin. Plus, the registration process is free and only takes a few minutes so it is definitely worth signing up for!